FTP details upon restoration/migration or plugin updates? FTP details upon restoration/migration or plugin updates? Why am I being asked for FTP details upon restoration/migration or plugin installation/updates? This happens if (and only if) WordPress does not have sufficient file permissions to write to the directories which it needs to write to. (To be more accurate, the PHP engine that WordPress is running on top of does not have these permissions). 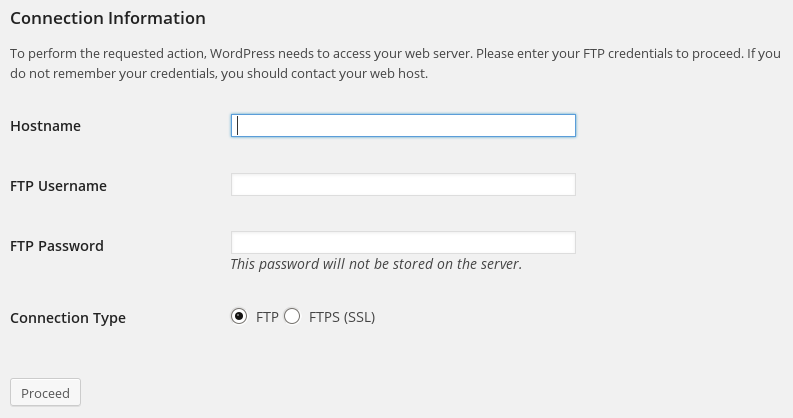 When this happens, WordPress has another trick up its sleeve: it asks you for FTP details. With those FTP details, it writes the files another way: by sending them over FTP to the webspace. Alternatively, if you are able, you can change the ownership and/or file permissions of your WordPress install, to allow PHP to be able to write to it. If you see this message installing/updating, then the important directories are: wp-content and wp-content/plugins. If you see it when restoring a backup, then the directory involved depends on the component being updated; you should check the permissions on the directory containing WordPress (if restoring WordPress core), and wp-content, and wp-content/plugins, wp-content/themes and wp-content/uploads, for other entities.